The Reverend J.D. 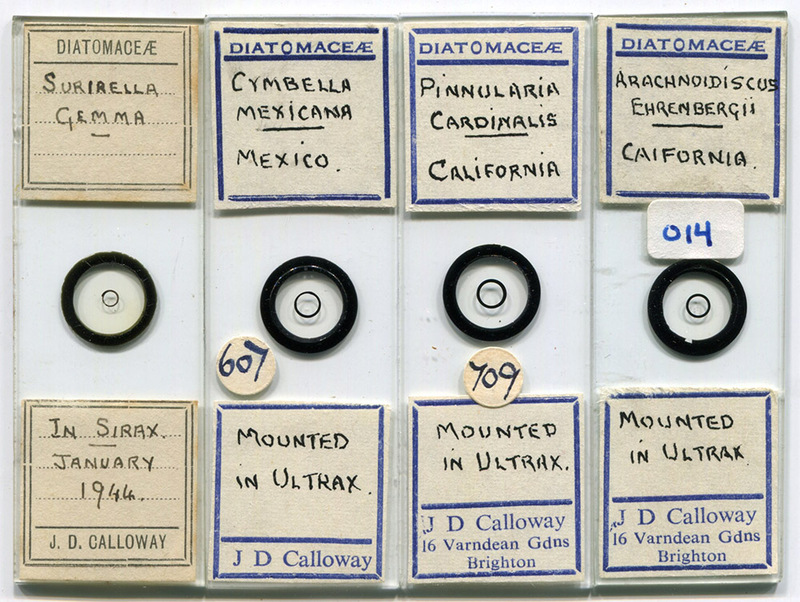 Calloway was an expert preparer of diatom slides (Figures 1 and 2). He was a member of the Quekett Microscopical Club and a Fellow of the Royal Microscopical Society. Figure 1. Microscope slides by J.D. Calloway. The left slide is dated 1944. The two on the right bear the address 16 Varndean Gardens, Brighton, his home during the later years of his life. Figure 2. 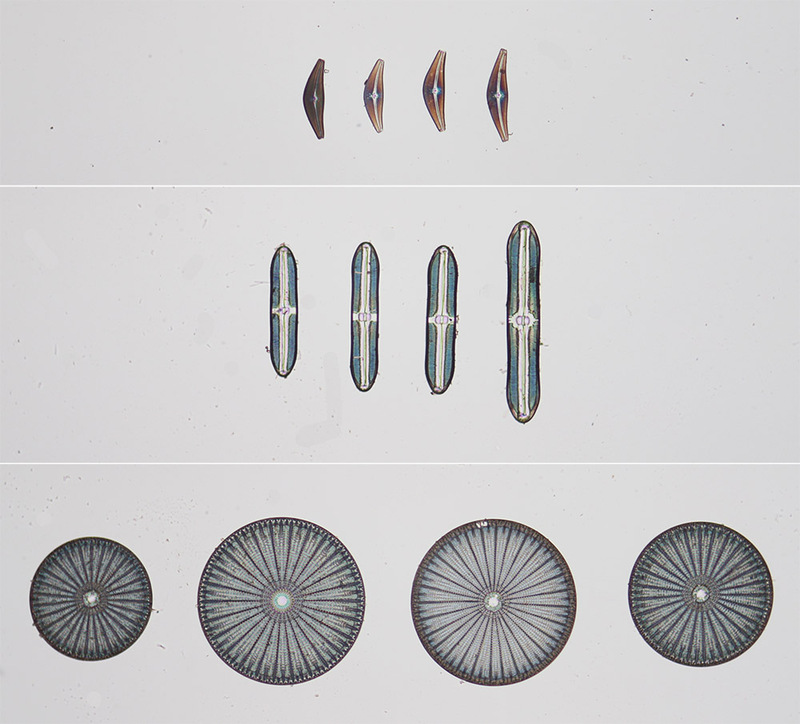 Selected and arranged diatoms by J.D. Calloway. Top to bottom, Cymbella mexicana, Pinnularia cardinalis, and Arachnoidiscus ehrenbergii (see Figure 1). All photographed using a 10x objective lens and C-mounted digital SLR camera, and images assembled with the same relative size. John Donald Calloway was born on October 24, 1903 in Brynmawr, Breconshire, Wales. He appears to have been the only child of John Penarwood and Sarah Jane Calloway. The 1911 census recorded the father as working as a “draper”. The family was moderately well-off, as they employed a domestic servant. By 1926, John was a minister in the Primitive Methodist Church of Kirton-in-Lindsey, Lincolnshire. As a minister, Calloway moved numerous times in his life. He married Mary Dawes in Warmsworth, Yorkshire during the summer of 1931. By 1939, they had moved to Stourbridge, West Midlands. Calloway joined the Quekett Microscopical Club on July 10, 1945, and the Royal Microscopical Society on November 17, 1948. In 1948, the Calloways lived in Hawarden, Chester. The following year’s membership roll of the QMC listed John’s address as Sheffield, Yorkshire. The 1954 membership roll of the Brighton and Hove Natural History and Philosophical Society listed Calloway’s address as 19 Graham Avenue, Brighton. He resigned from the QMC before 1968, so it is not clear when he moved from Graham Avenue to his final home at 16 Varndean Gardens, Brighton. I found little else about Calloway’s life. Diatom expert Klaus Kemp was quoted as stating that Calloway “went blind”. Perhaps some readers who knew Reverend Calloway could share further information. J.D. Calloway died in late 1978.